“The Mechanicsburg Freeze Out” was held Feb. 18 at Mechanicsburg High School. This 10K race was followed by a Chili Cook Off and Dessert Auction and was founded several years ago by Mechanicsburg native Ed Ropp. The non-profit Running4Life club sponsored the event and will host the sixth annual Fearless 5K at Goshen Park on Aug. 18 at 10 a.m. Runners, from left: Gavin Haffner, Josh Spinner, Kathy Durham, Marc Pack, Johnathon Pack, Andy Foss, Lou Kramer, Haley Cochran, Jill Cochran. 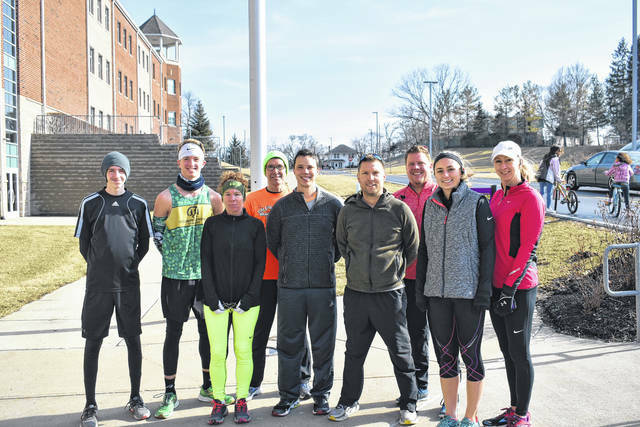 https://www.burgtelegram.com/wp-content/uploads/sites/17/2018/03/web1_Chili5K0010.jpg“The Mechanicsburg Freeze Out” was held Feb. 18 at Mechanicsburg High School. This 10K race was followed by a Chili Cook Off and Dessert Auction and was founded several years ago by Mechanicsburg native Ed Ropp. The non-profit Running4Life club sponsored the event and will host the sixth annual Fearless 5K at Goshen Park on Aug. 18 at 10 a.m. Runners, from left: Gavin Haffner, Josh Spinner, Kathy Durham, Marc Pack, Johnathon Pack, Andy Foss, Lou Kramer, Haley Cochran, Jill Cochran.